Irrigated agriculture on the El Sur Ranch began in 1928, using water diverted from the Big Sur River to grow a variety of crops, including artichokes and peas. 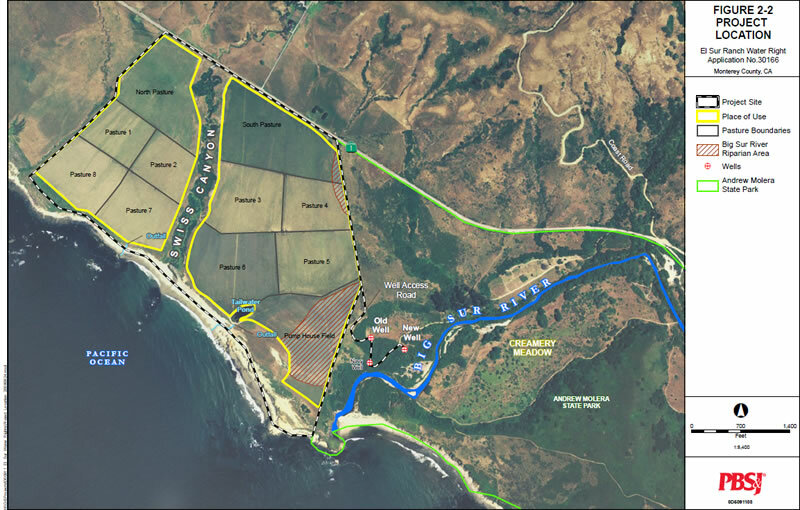 Since 1949, a well on the Molera property, near the mouth of the Big Sur River, has continuously pumped what was lawfully presumed to be ground water for the purpose of irrigating El Sur Ranch pastures. Provisions for the continued use of this well were made within the conveyance agreement to DPR. In 1984, a second well was placed in operation on the Molera property that also provides water to the ranch. The right to drill and operate this second well was recognized within the 1972 deed to DPR, and was later reinforced through litigation resulting in a 1982 easement perfecting El Sur Ranch's right to operate the well. Operation of this second well has enabled El Sur Ranch to efficiently reduce its average annual water usage.